New tastes in protein are being made possible by packaging technology. The recommended daily allowance (RDA) for protein is about 0.36 grams of protein per pound of body weight. For this 200 lb male author, about 72 grams of protein per day is needed to repair muscles, make hair, blood, connective tissue, antibodies, and enzymes. That’s why protein is the foremost nutrient in our diets. Most Boomers and Generation Xers were taught the “Basic Four” food groups consisting of: Vegetables and Fruits, Milk, Cereals and Breads, and Meat. It was encouraged that we have at least two servings per day of the last one, assuming that we would derive our daily allowance of protein from meat, poultry, and fish. Selection food sources of omega 3 and unsaturated fats on wooden background. More and more Generation Y and Z people, however, are opting for diets that don’t allow any meat consumption. But forgoing meat makes it even more difficult for vegetarians to get their daily allowance of protein. That’s always been one of the biggest challenges of any vegetarian diet: how to acquire protein without the consumption of meat. 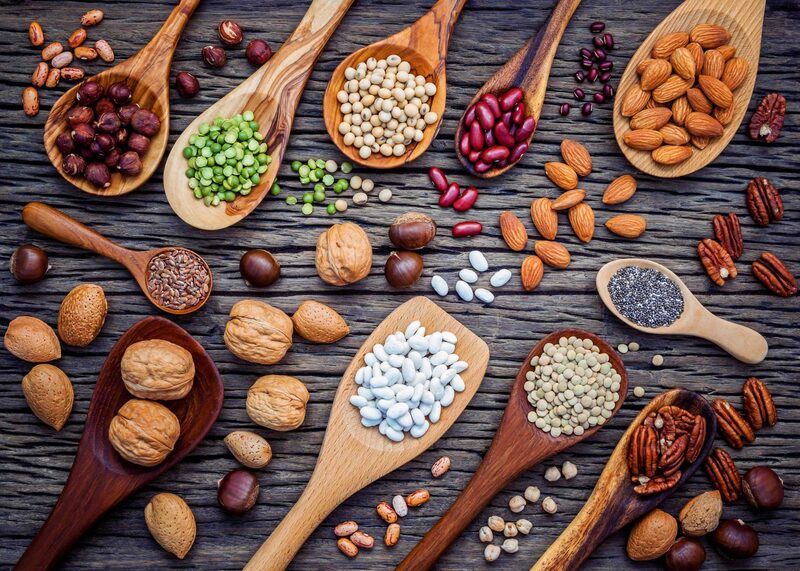 Vegetarian and vegan diets rely on plants and nuts for protein, including lentils, chickpeas, peanuts, almonds, beans, broccoli, kale, and mushrooms just to name a few. Considering a significant increase in the percentage of the population actively participating in these diets, it’s no surprise that sales of plant-based food increased over 8% last year. Plants are replacing protein derived from dairy as well. Within three years, Forbes reports that plant-based dairy alternatives are expected to comprise up to 40% of “dairy” beverages. Although environmental and animal welfare considerations serve as the primary motivations for today’s vegetarians, future growth in the popularity of these diets will depend on the continual evolution of the taste of plant-based foods. For the here and now, discriminating vegetarians are turning to convenient pre-packaged proteins. They are driving increased sales of these products, which in turn drives product innovation. In Sweden, for example, nearly 60% of beans sold on supermarket shelves in Sweden are packaged in Tetra Recart® cartons. This innovative packaging solution, leveraged by an industry-leading co-packer like IPM Foods, enables food manufacturers to bring fresh, healthy, and tasty new products to market. To learn more, contact an IPM Foods representative today.